Fronting his eighth All-Starr Band, the cheerful singer and drummer brought new direction to a concept that’s served him well since 1989. Filmed live at Casino Rama in Toronto, Canada - All Starr 2003 members are John Waite (The Babys, Bad English), Colin Hay (Men at Work), Paul Carrack (Squeeze, Mike & The Mechanics), Sheila E. (Prince), Mark Rivera (Billy Joel.) During this summer 2003 tour, Ringo Starr allowed a cameraman to follow him and the All-Starrs throughout the course of their travels for the first time ever! This DVD is your ticket to an unscripted, uncensored and unprecedented look at a Rock Legend at work -and at play, behind-the-scenes footage brings you up close and personal with the boys - and girl - in the band. Join in with Ringo as he gets a little help from his friends on classics like "Honey Don’t", "Boys" and "Yellow Submarine"! Plus, experience an All-Starr take on 80s Hits like Mike & The Mechanics’ graceful "Living Years", Sheila E.’s funk-pop "Glamorous Life" and Men At Work’s cult favorite "Down Under". As live performers, it took a while for any of the ex-Beatles to re-embrace life on the road. When that band retired from live concerts on August 29, 1966, they were totally fed up with the situation, and that fact left many of them very reluctant to head back out before the unwashed masses. Paul McCartney became the first to mount an actual tour. He formed the band Wings in 1971 and had them on the road by early 1972, as he started with an impromptu trek through universities in the UK. This didn’t come as a surprise; as a Beatle in the late Sixties, he thought the band should play live again, but the others disagreed, and the most that came of this was the rooftop show captured in Let It Be. 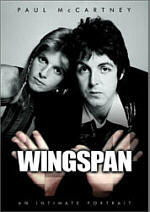 Paul did a lot of touring through 1976 and seemed primed for extensive concerts in 1980. He got through a short UK tour in the winter of 1979-80 but his arrest for marijuana possession in Japan ended that trek, and apparently that soured his desire to play, for he didn’t go out again until the massive worldwide tour in 1989-90. Since then, Paul did a shorter world tour in 1993 and didn’t come back until 2002, when he launched a good-sized tour. Macca went to European stadiums in the summer of 2004 and should be back on American shores in 2005. John Lennon never toured, but he did play a few isolated shows in addition to guest spots like a three-song stint at a 1974 Elton John concert. Lennon’s most significant performances came in 1973, when he did two benefit shows that were released posthumously as Live in New York City. 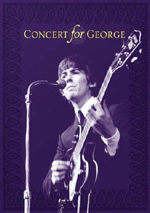 George Harrison beat McCartney to the stage via his two Concerts for the People of Bangladesh in 1971, but he didn’t formally tour until 1974. Then he went out on a fairly short US trek. Like Lennon, Harrison also occasionally did guest spots, but his only other actual tour came in 1991, as he made a quick jaunt through Japan. Before 1989, Ringo Starr also did some guest spots; indeed, he played drums at the Bangladesh shows and performed his own hit “It Don’t Come Easy”. However, Mr. Starkey never indulged in a full solo tour until 1989 when he formed what he called the All-Starr Band. The premise was that Ringo packed the group with semi-names; the initial band included folks like Dr. John and Joe Walsh. It did pretty well and spawned an amazing eight follow-up tours to date. For the most recent incarnation of the All-Starr Band in 2003, Ringo formed a group with Sheila E on drums, Colin Hay (Men At Work) on guitar, John Waite on bass, and Paul Carrack (Squeeze, Ace, Mike and the Mechanics) on keyboards. 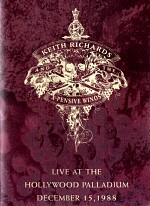 The band went out on the tour represented on this DVD. The program includes 16 songs. Half of these star Ringo: “It Don’t Come Easy”, “Honey Don’t”, “Memphis In Your Mind”, “I Wanna Be Your Man”, “Yellow Submarine”, “Don’t Pass Me By”, “Boys”, and “With a Little Help From My Friends”. Each of the other four gets two songs apiece. Hay does “Down Under” and “Who Can It Be Now”, while Carrack performs “How Long” and “Living Years”. Sheila plays “A Love Bizarre” and “The Glamorous Life”, and Waite does “When I See You Smile” and “Missing You”. Unfortunately, this loses 10 songs played at the shows. I assume part of the reason the Ringo Starr and His All-Starr Band: Tour 2003 DVD sacrifices so much material stems from the decision to make this more of a documentary than a concert presentation. It intercuts songs with shots from behind the scenes. In these we follow the Band around during the tour and see them at rehearsals, soundchecks, backstage, and other circumstances. We also hear interview bits from the Band members as well as others associated with the tour. While the behind the scenes material musters some interest, the interviews tend to be fluffy. Mostly we hear praise for Ringo and all the others. The Band members gush about how lucky they are and how blessed they are to play with Starr, and that’s about it. We don’t learn much from these segments. As for the concert footage, it’s competent and not much more. I saw Ringo live during the initial All-Starr Band tour in 1989. At that time, he presented an awkward stage presence and he didn’t seem to know what to do with himself as he sang; he’d sway in a stilted manner and seemed puzzled not to have sticks in his hands. After 14 years and eight more tours, surely Ringo would possess better stage command in 2003, right? No, not really. He still showed little stage presence, as he mainly bopped back and forth like an exuberant uncle who took his turn at the mike with a wedding band. The Band lacked much personality in general, as none of the performers really seemed able to grab the spotlight. That came as something of a surprise since all of the members had headlined in their own rights. When you look at the original All-Starr Band, you find mostly folks who usually worked as support to someone else; they might occasionally get the spotlight, but not consistently. Carrack’s career mostly followed that path, but while Sheila has drummed for Prince, she’s spent a lot of time solo. Waite was in the Babys but he also forged a decent solo career, and Hay was always the main focus of Men at Work. You’d think they’d be better able to take charge on stage. Maybe they backed off and toned down their personalities to make sure they didn’t upstage Ringo. Not that this would be tough to do, as the unassuming Starr still seems most content to support the others; he looked happiest in this program when he sat behind the skins and just had to drum. As for Ringo, he never had much of a voice, and it’s deteriorated mildly over the years. He didn’t sound significantly worse than in the past, but some flatness occurred that made his vocals a bit tough to take on some tunes. He mostly played the usual suspects, though it was good to hear him do some numbers from his then-new Ringo-Rama album; it’s nice to know he didn’t rely solely on nostalgia. Nostalgia still remained the order of the day, as one might expect of a band that consisted of members whose chart-busting days occurred long ago. It’s nice to see Ringo still putting himself out there after all these years, especially since he came to the stage at such a late age. He remains a lackluster performer, though, so don’t expect fireworks from the mediocre work on display here. 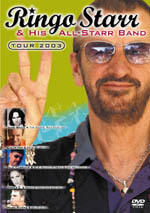 Ringo Starr and His All-Starr Band: Tour 2003 appears in an aspect ratio of 1.33:1 on this single-sided, double-layered DVD; due to those dimensions, the image has not been enhanced for 16X9 televisions. Actually, the aspect ratio changes occasionally, as the concert segments appeared in 1.78:1 dimensions. This meant not only a discrepancy in ratios but also in quality, as the concert footage looked significantly better than the behind the scenes shots. Both showed some concerns, though. Part of the problem with the 1.78:1 material stemmed from the absence of anamorphic enhancement. Jagged edges popped up fairly frequently, and I also noticed some shimmering. Close-ups looked nice and tight, but wider shots occasionally became a bit dodgy and ill-defined. The source footage seemed to be strong, but the problems that come with a lack of enhancement. If the DVD presented the performances on their own with 16X9 enhancement, I’m sure they’d look great, but as it stood, the elements failed to present great definition. On the other hand, the concert footage offered terrific definition of colors. As usual during concerts, most of the hues came from lighting, and these featured the standard array of tones. They always came across as tight and vivid. Blacks seemed similarly rich and deep, and the occasional low-light shot was clear and well-developed. No source defects or artifacting appeared. As for the behind the scenes material, it seemed to come from a consumer-grade video camera, which meant the usual array of flaws. Sharpness mainly looked decent but unspectacular, as parts of the image were a bit ill-defined. Even more jags and moiré effects popped up here, though I still didn’t see any artifacting outside of the darkest situations. Colors seemed okay but were generally somewhat drab, but blacks were pretty solid. Overall, the image was watchable but nothing special. When I moved to the Dolby Digital 5.1 audio of Tour 2003, I found a more positive impression, but not a flawless one. As with the picture, the sound split into two sides. For the behind the scenes bits, the soundfield seemed monaural and remained focused on the center channel. All of that audio came from the source tapes and was decidedly low-fi. Speech sounded clear and intelligible but showed some of the thinness one expects of this sort of recording. Music also lacked definition, but I didn’t anticipate anything more from this kind of “on the fly” footage. Unsurprisingly, the concert material improved in everyway, though one oddity occurred: the absence of a center channel. Actually, I shouldn’t say that the center speaker got no usage; if I stuck my head very close to it, I heard some faint audio. However, this was exceedingly minor, so the music spread mostly across the right and left forward speakers. The absence of a center channel meant that localization of singing wasn’t always as firm as I’d like, but the vocals mainly stayed in the middle, and these issues caused no distractions. Otherwise, instruments demonstrated good placement and delineation across the spectrum, as they were appropriately located and blended together well. Surround usage showed light reinforcement of the music plus some crowd noise; the rear speakers didn’t do a lot during the program. For the concert footage, audio quality was strong. Instruments appeared concise and natural, with the right amount of bang and pop. Vocals were consistently warm and firm, and that included background singing, which seemed well-recorded. Highs came across as bright, while bass response appeared deep and tight. Tour 2003 didn’t present the best concert audio I’ve heard, but it mostly was very satisfying. Only a few fairly minor extras complete the package. We get an acoustic version of Here Comes the Sun. Shot at a July 28, 2003 rehearsal in Toronto, it lasts two minutes and 55 seconds and seems thoroughly unspectacular. Oddly, the main program omits this song from the setlist, so we can’t compare it to the final version. In the Band Biographies area, we get listings for Ringo as well as Colin Hay, Paul Carrack, Sheila E, John Waite, and Mark Rivera. These provide decent basics about each performer’s career; some mistakes occur. The Tour Gallery depicts 24 images from concerts, while Ringo’s Discography gives us tracklistings for Starr’s various solo albums; this area also includes some mistakes, especially when the entry for 1973’s Ringo actually offers the song list for 1983’s Old Wave. 15 years after his first solo tour, Ringo Starr continues to perform before live audiences, as documented on Ringo Starr and His All-Starr Band: Tour 2003. His act hasn’t changed much over that time; Band members came and went, but the essential act remained the same, for better or for worse. Or for mediocre, as Ringo still seems like a bland live performer. The DVD offered erratic but generally positive picture with mostly strong audio and a small set of extras. I’d leave this one for die-hard Beatle fans, as Tour 2003 didn’t seem very memorable.